With less than 3 months to go the training is starting to heat up. Last weekend the Financial News Strava group racked up an impressive cumulative 948km. There are a number of ways to motivate yourself for such an epic ride but I think the graphic Fareed found depicting Mont Ventoux does the trick nicely. 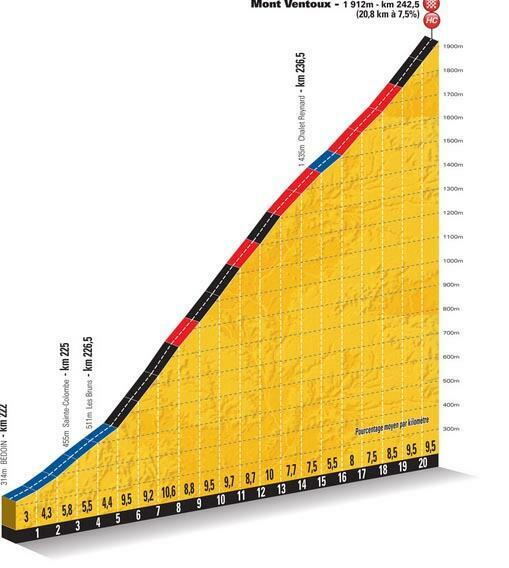 We face this mythical climb on day 7. We will have cycled a long way already, some 700 miles. This is our Everest and the scene of the Financial News London to Monte Carlo 2 inaugural King of the Mountain stage. To the victor the spoils. This entry was posted in Uncategorized and tagged london to monte carlo, Mont Ventoux, training by jcdw10. Bookmark the permalink.